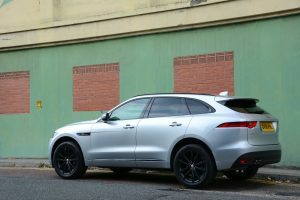 The Jaguar F-PACE looks fantastic, it offers lots of space, has excellent handling, and in the case of our all-wheel drive 2-litre diesel test car, it has an official economy figure of 53.3mpg. Jaguar Land Rover is a company that has been transformed over recent years. Things started to step up a gear as soon as the Range Rover Evoque was unveiled. Since then Land Rover has gone from strength to strength. Now it’s the turn of Jaguar. 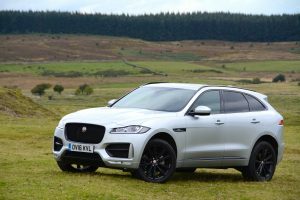 The F-PACE promises to be a huge success that will help to transform the fortunes of the Jaguar brand – but it’s just the start of extremely exciting things to come. The F-PACE looks fantastic. It shows how simple, uncluttered design is so much better than fussy design (compare the F-PACE to the latest Honda Civic if you’re not convinced). As with most of the latest SUVs, it needs huge wheels to keep things in proportion – our test car had (optional) 20-inch alloys. We’re not sure that the silver paint with all-black alloys of our test car is the best visual combination. 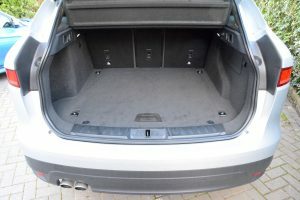 The interior is a pleasant place to be, and of course there’s lots of space for passengers and luggage. Our test car had the 180PS, 4-cylinder, 2-litre diesel engine, with an 8-speed automatic transmission and all-wheel drive. During our week with the Jaguar F-PACE we took in a variety of roads between places such as North Wales, Manchester city centre and Yorkshire. 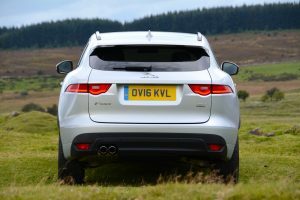 On motorways, the F-PACE is comfortable, refined and efficient. 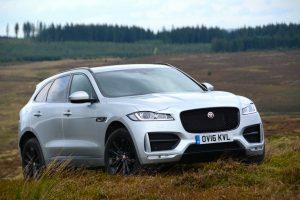 However it’s on twisting roads in areas such as North Wales where the F-PACE really shows its strengths. For a tall SUV weighing almost 1.8 tonnes, its handing is amazing. Yet somehow the excellent body control is combined with a comfortable ride as well as direct and responsive steering. 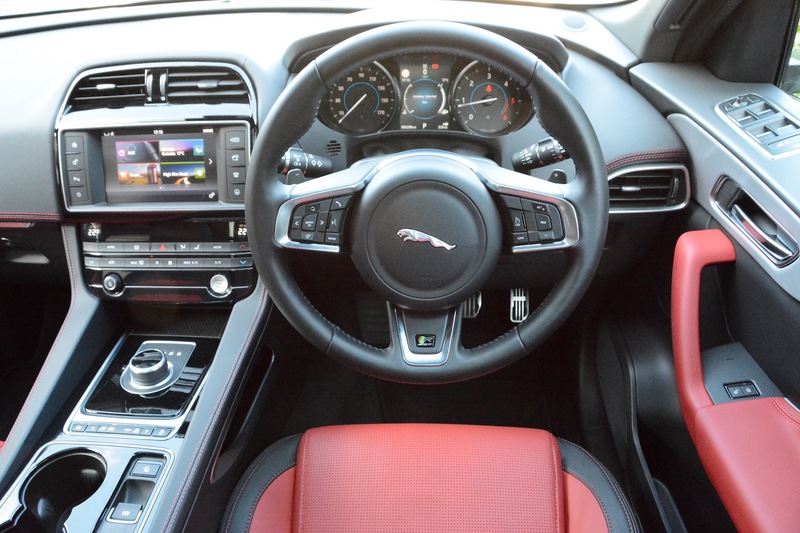 The F-PACE has drive settings consisting of Dynamic; Normal; Eco; Rain, Ice, Snow. If you’re driving enthusiastically then Dynamic is the setting to choose – especially in combination with the Sport setting on the transmission. You can also change gear manually using steering wheel-mounted paddles, adding to the sports car-like driving experience. If you leave the car in the setting of Normal for such driving then the engine can sound strained, and if this car has a weak point, it’s the engine. For business users sitting on the motorway all day, it’s refined and efficient. But if you also want to enjoy the car’s sporty handling to its full potential, then the 3-litre diesel is the engine to go for; a 2-litre diesel engine in a 1.8 tonne SUV is never going to provide an entertaining power-to-weight ratio. The combination of this 2-litre diesel engine and automatic transmission also means it’s not the most responsive of vehicles around town. A reason why the body control of the F-PACE is so good is because the suspension doesn’t allow much roll. 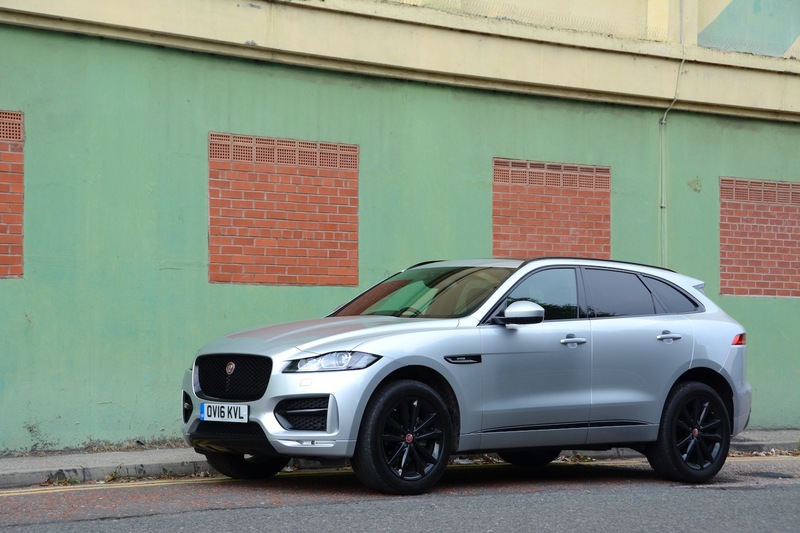 So if you do venture onto rough surfaces in the F-PACE it’s not as comfortable as a Range Rover Sport. 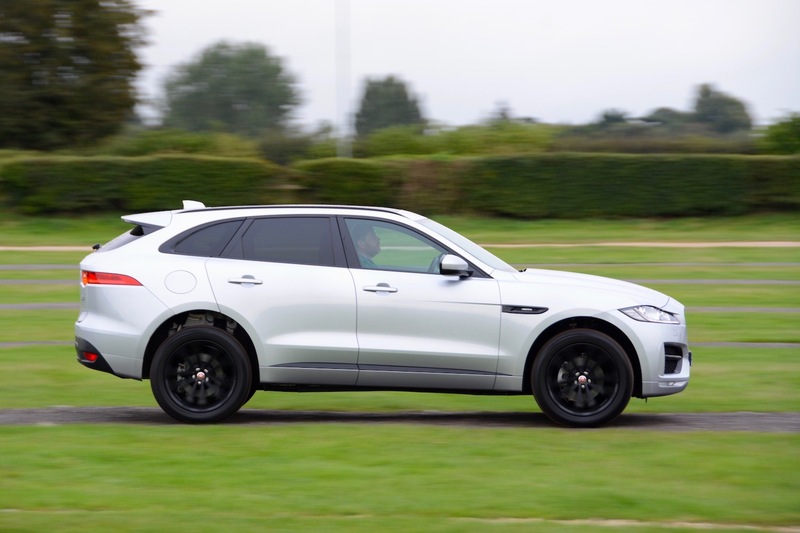 So it’s looking like almost universal acclaim in terms of the F-PACE driving experience. But aside from the engine sounding laboured under certain conditions, are there any other issues? Well, there’s nothing major, but a small complaint is that the steering wheel spokes, in common with other Jaguars, are too thick for you to wrap your hands around the rim in this area. Another gripe is that to put on the heated seats, you have to press a button on the dash, and then press a separate button on the touchscreen. Just give us one switch! Many cars in this class – and increasingly in classes below – have reversing cameras, but not so in the F-PACE. But perhaps the biggest annoyance is that you can spend ages pressing small buttons on the satnav screen to zoom out on the map, and then the system zooms itself back in again automatically. 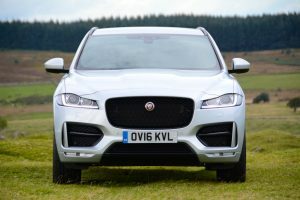 The official NEDC combined fuel economy figure for the Jaguar F-PACE R-Sport 2.0d 180PS AWD Automatic is 53.3mpg, equating to CO2 emissions of 139g/km. On a journey from York to Manchester on a very slow M62 motorway, in Eco mode, we achieved 49.7mpg. Overall, after a week of mixed driving, with around 80% comprised of long journeys, we averaged 42.1mpg. We’d say this is a good result for a 1.8 tonne SUV that drives as well as the F-PACE does. If you want slightly better economy, then the rear-wheel drive model has a combined figure of 57.7mpg. However the really interesting statistic is that the V6, 3-litre diesel has an official economy figure of 47.1mpg. It may not be as green as our test car, but if you want to enjoy the F-PACE, and if you’re not penalised through a company car scheme, then this would be our choice. Our F-PACE R-Sport 2.0d 180PS AWD Automatic test car cost £40,360. Options included metallic paint (£675), 20-inch alloys (£1,200), Fixed Panoramic Roof (£1,200), Black Pack (£660), Activity Key (£300) and Privacy Glass (£375) – taking the price as tested to £44,770. You can specify rear-wheel drive rather than all-wheel drive, there’s a manual transmission, a V6 3-litre diesel engine and a V6 3-litre supercharged petrol engine. 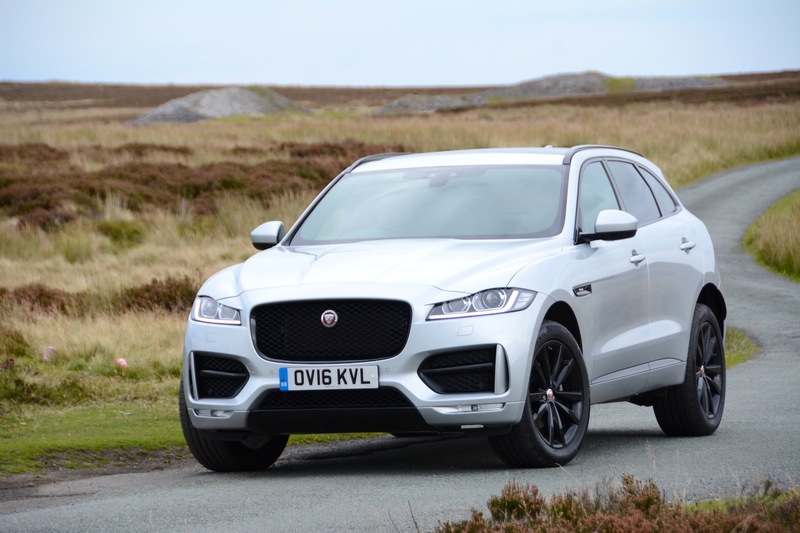 The Jaguar F-PACE looks fantastic. It’s also excellent to drive. For motorway miles, the 2-litre diesel engine is relatively efficient. 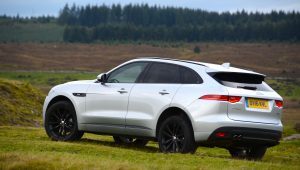 However this engine can sound strained when pushed, so if you’re buying an F-PACE with your own money, and if you want to enjoy driving it, you should try the 3-litre diesel, which still returns 47.1mpg. So it’s all good, and the Jaguar F-PACE is awarded a Green Car Guide rating of 9 out of 10. But hang on. There’s one more thing. The F-PACE is good, but there’s one car which promises to be even better. That’s the Jaguar I-PACE. This is a sporty, all-electric version of the F-PACE. It also looks fantastic, it offers zero emission driving (with a range of around 300 miles), and the performance of the Jaguar F-TYPE. It’s also practical, with seating for five and all-wheel drive. So the F-PACE is good, but it’s the I-PACE that should win our Car of the Year Award – even before it’s been launched. The future for people wanting a zero emission car that is good to drive and that is also practical – in other words exactly what Green Car Guide has been searching for over the last 10 years – has just got that bit brighter.